This past weekend, Indian Summer was in full bloom in downtown Anacortes, Washington. 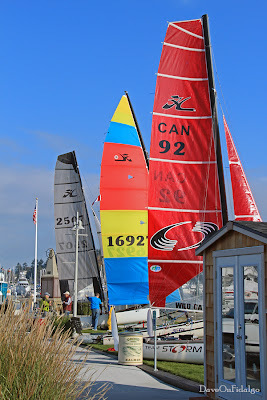 Catamarans were also blooming at the Cap Sante Boat Haven. Apparently there was a regatta underway, the U.S. Sailing Multihull Championship. For landlubbers, it was a great photo-op. Anacortes, Washington on the northern end of Fidalgo Island was incorporated in 1891. In the same year, Benjamin Harrison was the U.S. President and Victoria was Queen of England. New York's Music Hall (now Carnegie Hall) opened with guest conductor Peter Ilyich Tchaikovsky. Arthur Conan Doyle's Sherlock Holmes appeared in print for the first time. In the year before, Vincent Van Gogh died in Auvers-Sur-Oise. 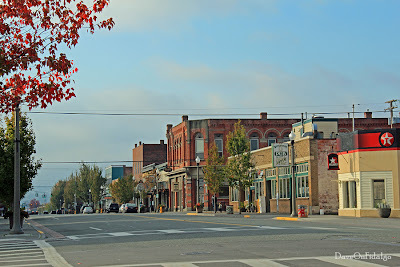 With a population just under 16,000, Anacortes is the second largest city in Skagit County. The area north of Twelfth Street is known as Old Town. The neighborhood features late nineteenth and early twentieth century architecture which has been carefully preserved. In the heart of Old Town, the Watermark Book Company is a local favorite. The elephant statue is new. I haven't found the story behind this little statue, but according to feng shui, elephants near the front entry will bring happiness and prosperity. I woke up to fog this morning. In the photo, Whidbey Island is almost completely obscured. 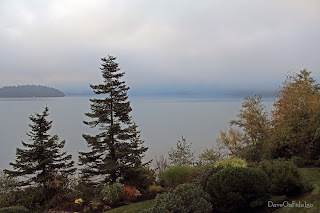 Around the Puget Sound region, September and October are the foggiest months. Sometimes it can last for several days in a row. At the time of the photo, the air temperature was 49.8° F (9.9° C), dew point 49.0° F (9.4° C), and the relative humidity was 97%. Remember that fog will form when the difference between the temperature and dew point is less than 4° F (2.5° C), and the relative humidity is close to 100%. Earlier, I couldn't see anything beyond the two fir trees. Since I had to go into town this morning, I decided to go early and check out the Anacortes Cap Sante Boat Haven. I wanted to see what the new camera could do in the fog. Contrary to folklore, the sun does come out in the Pacific Northwest. Such was the case this past week and the day beckoned for a hike up the beach into Similk Bay. 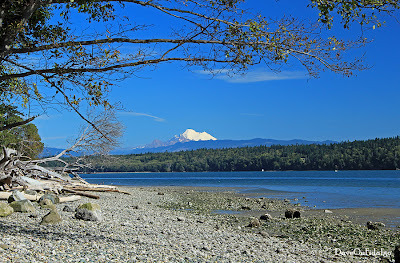 I intended to do some beachcombing, but as I rounded the bend, Mount Baker came into sight, demanding my full attention. I couldn't take my eyes or camera lens off of her. 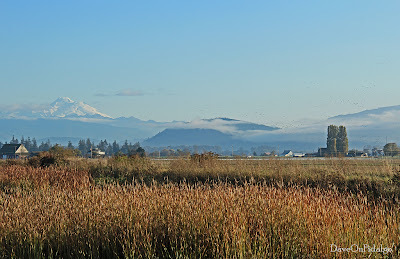 Like Mount Saint Helens, Baker is one of the active volcanoes in the Cascade Range, a segment of the Pacific Ring of Fire. This chain of volcanoes reveals the region affected by the Cascadia Subduction Zone. Baker has been at rest since 1880, only occasionally emitting steam through vents at the summit. The height of the mountain is 10,781 feet (3,286 meters), the third tallest in Washington State and the fifth tallest in the Cascade Range. From my viewpoint, she is about 20 miles (32 km) away.